20 cm 416 p. : ill., maps, ports. During the glory days of the French Renaissance, young John Calvin (1509-1564) experienced a profound conversion to the faith of the Reformation. For the rest of his days he lived out the implications of that transformation-as exile, inspired reformer, and ultimately the dominant figure of the Protestant Reformation. Calvin's vision of the Christian religion has inspired many volumes of analysis, but this engaging biography examines a remarkable life. 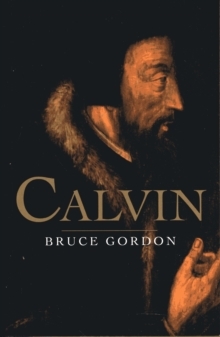 Bruce Gordon presents Calvin as a human being, a man at once brilliant, arrogant, charismatic, unforgiving, generous, and shrewd. The book explores with particular insight Calvin's self-conscious view of himself as prophet and apostle for his age and his struggle to tame a sense of his own superiority, perceived by others as arrogance. Gordon looks at Calvin's character, his maturing vision of God and humanity, his personal tragedies and failures, his extensive relationships with others, and the context within which he wrote and taught. What emerges is a man who devoted himself to the Church, inspiring and transforming the lives of others, especially those who suffered persecution for their religious beliefs.